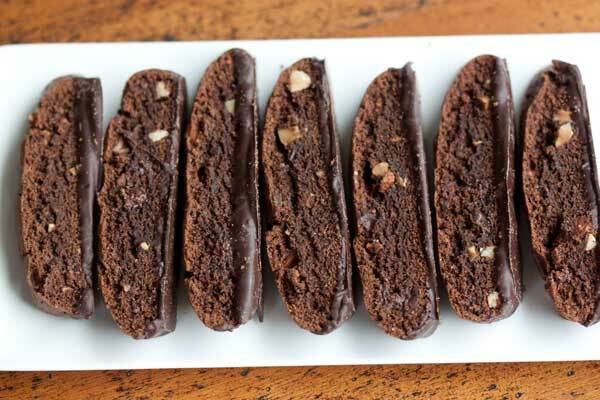 My friend Karen Tedesco tipped me off to this double chocolate biscotti recipe. The original version is from an old issue of Gourmet Magazine and can be found on both Epicurious and in the big, yellow Gourmet Magazine Cookbook . Over the years I’ve changed it a bit and this recipe is the end product. Double Chocolate Biscotti made with cocoa powder, oil, chocolate chips and nuts. Preheat oven to 350°F. Line a large baking sheet with parchment paper. Whisk or sift together flour, cocoa powder, baking soda, and salt. In a mixing bowl, using an electric mixer, beat together oil and sugar. Add eggs and beat until combined, then beat in the vanilla and coffee powder (or extract). Stir in flour mixture to form a stiff dough. Stir in nuts and chocolate chips. Turn dough out onto baking sheet and divide it into 2 equal parts. Dampen hands with a little water and form each dough halve into a 12x2 inch log, leaving at least 5 inches of space between the logs. Bake logs for 30 or until slightly firm to the touch. Cool biscotti on baking sheet for about 5 minutes. Reduce oven heat to 300 degrees F.
On a cutting board cut biscotti diagonally (cut straight down, don't saw) and stand it on the baking sheet so that both sides are exposed. Bake for about 12-15 minutes or until it starts to feel a little dry to the touch. Let cool completely. It will crisp up a little more as it cools. I have to agree with Sweetnicks. I’m not a biscotti fan and I have had bad experiences (too dry), but this looks DELICIOUS! 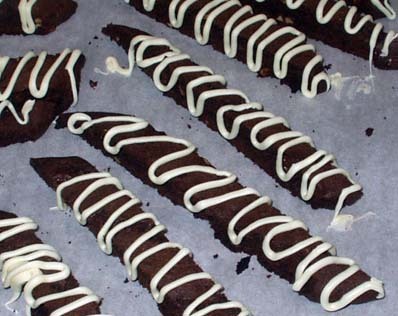 The Biscotti looks great, and this comes from a non-biscotti fan! This is the recipe I made for the bake sale a few months back and it was a giant hit. I made it as is but I love the white squiggly things. I’ll have to try it!